Guys, guys, guys GUYS GUYS GUYS I am SO EXCITED. I totally forgot until today about the Christmas gift my sister is giving me. Peter S. Beagle (perhaps the writer I revere most in the world) is touring the country and screening the movie The Last Unicorn in select theaters. I get to go tomorrow! It's like I'm being given a chunk of my childhood! There is no movie I've loved so much for such a huge portion of my life. And while the movie has a couple really unfortunate and unnecessary musical numbers performed by Jeff Bridges and Mia Farrow (whose voice cannot be made passable by all of the unicorn magic in the world), it's otherwise a really beautiful, funny, and complex film. If you've never read anything by Peter S. Beagle, you owe it to yourself to give it a shot. 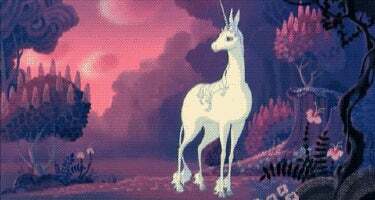 The Last Unicorn is one of the most piercingly lovely things I've ever read. His knack for beautiful manipulation of language runs throughout all of his writing. A Fine and Private Place, which is a novella about two ghosts falling in love with one another even as they forget who they once were, is also gorgeous. If a theater ever does a double showing of The Last Unicorn and The Neverending Story, my head will actually explode from the intensity of the nostalgia for my childhood. I am practically peeing from excitement.